Morgan State University senior Temprest Myers worries constantly about how she’ll pay back her student loans when she graduates. The St. Paul, Minn., native is working a security job, making $12.50 an hour on three 10-hour shifts a week. And she already owes $38,000 in student loans. She says that some of her classmates are in even more dire straits, owing $80,000 in student loans in their second year of school. “The presidential candidates should be paying a lot of attention to this,” Myers says. Other students feel the same way, according to a recent survey by LendEDU, a Delaware-based marketplace for student loan financing run by 21-year-old Nate Matherson. “It’s a big issue on the minds of young voters,” Matherson says. The online survey of 513 students nationwide who had graduated with college-loan debt asked whom they supported for president. Nearly 40 percent chose Vermont Sen. Bernie Sanders, 23 percent went for former Secretary of State Hillary Clinton and about 11 percent chose business mogul Donald Trump. But when asked which candidate was best-equipped to deal with student loan debt, Sanders and Clinton were first and second, and Trump fell to eighth place behind fellow Republican Ben Carson. Another facet of the student-debt problem is that it disproportionately affects African-American and low-income students. The New York-based public policy organization Demos did a study that found that black students borrow more, and do so more often, to get a bachelor’s degree. It found that 81 percent of African-American graduates of public schools borrow, compared with 63 percent of white graduates. Even for associate’s degrees at public institutions, 57 percent of black associate’s degree recipients borrow, compared with 43 percent of white students, and African Americans borrow nearly $2,000 more than the white students. A second Demos study (pdf) found that over half of black households ages 25 to 40 have student debt, compared with 39 percent of young white households. 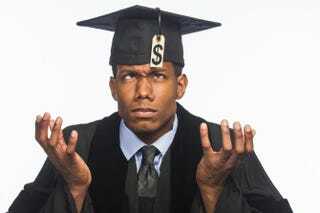 It also found that nearly 36 percent of black households making over $50,000 a year have student loan debt, compared with 15.5 percent of white households in the same income range. He says that this affects everything from the ability of those with student debt to buy houses to their liquid assets and retirement savings. Huelsman adds that students of color are also targeted by for-profit schools, such as the now defunct Corinthian Colleges Inc., that charge high prices but don’t provide much return on a degree. Huelsman says that Demos has a series of proposals to help solve the problem, including a system in which everyone has an option to graduate from a two- or four-year public college without taking on debt. He adds that the federal government could provide more incentive for states to increase their higher education budgets. Democratic presidential candidate Sen. Bernie Sanders of Vermont has promised to make tuition free at public colleges and universities, and both he and Hillary Clinton support allowing students to refinance their loans at lower rates. Clinton supports tuition-free community colleges, and her education plan would ensure that students wouldn’t have to take out loans for tuition at four-year public colleges. On the Republican side, front-runner Donald Trump has criticized the federal government for making a profit on school loans. His rival Sen. Marco Rubio of Florida has said that he came out of law school with more than $100,000 in student debt. He has also called student loans worse than indentured servitude. Rubio has proposed that private investors loan money to students, who would then agree to repay it with a percentage of their income over the next 15 to 20 years. Late last year the Obama administration opened a student loan repayment program known as Revised Pay as You Earn, capping borrowers’ monthly bills to 10 percent of their income, and forgiving the debt after 20 years of repayment, for anyone with what’s known as a direct federal loan. But students like Morgan State’s Temprest Myers are still worried. “A lot of people don’t know how stressful it is to have to go to school and not be able to afford it and need a degree for a job,” she laments. Myers also has a suggestion for students who are just beginning their college education.